The Unicorn was a mystical creature described in ancient Greek and Roman myths. They were placed among virgin saints and said to be an emblem of purity. Though it would fight savagely when cornered, it could be tamed by a virgin's touch. 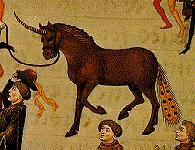 During the Middle Ages, and even later, the unicorn's horn (as it was alleged to be), because of its fabled purity, was a popular ingredient for medicines and for alchemical reactions. Potentates and pontiffs obtained reputed unicorn's horn because it was considered strong protection against poison. The horn was also believed to ward off stomach trouble and epilepsy. The Unicorn is found throughout world legends.